A Well-Seasoned Life: 500 Followers and a Giveaway!!! 500 Followers and a Giveaway!!! This week, my blog reached the 500 followers mark with the combination of both the Google Friends Connect and Network Blogs. It's so exciting and such a milestone for A Well-Seasoned Life. I still can't believe that there are people out there who are reading my words, but I'm so grateful that you are. Last summer, I decided to follow my dream of becoming a writer and, even if this is as far as it ever goes, I've accomplished that. And, it's all thanks to those of you out there who are following, reading, and encouraging. To show my appreciation, I'm having a little giveaway. 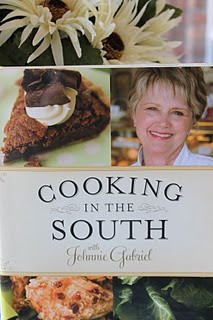 One of my lucky followers will receive a copy of one of my favorite cookbooks, Cooking in the South by Johnnie Gabriel. I've reviewed this cookbook here on the blog and have featured several recipes from it. It's an endearing cookbook. The more you read it, the more you'll like it. I promise! Kim, I love cookbooks and a free one would be even better! You really should write one yourself, it would be a bestseller. Love your blog and look forward to more delicious recipes. Thank you for your kind words. That would be the realization of a dream! Congratulations on getting 500 hundred followers, Kim. You have such a great blog. Keep it up. :-) I hope to win. I love Southern cooking and Georgia, plus since she owns a bakery, her desserts must be fantastic too. Oh yes...I'd love for a chance to win a new cookbook! Congratulations on your 500 followers, I'm not quite there yet, lol! Congrats! WOW that came up fast huh? Congratulations! I would love to add this cookbook to my collection....especially with your recommendation! Congratulations! Would love this cookbook. Congrats! This books looks awesome! Congrats on 500! I have had my eye on this cookbook for a few weeks now. I would love a new cookbook to read through. Congratulations Kim on 500 follows!! And oh yes, I would love to have my name added to this drawing!! !I love cookbooks and would really like to win this one!! congrats!! I am a new follower (as of last week) and am loving your blog! Congratulations!!! I'd love to have that cookbook. Thanks for the chance. I would love to win a new cookbook, my husband won't though, says I have an addiction to them! LOL..you chummed me in with the White Texas sheet cake, made it and it was a hit! Can't wait to make the peanut butter one. congratulations! I LOVE your blog and would LOVE this cookbook! Thank you for the entry!! I saw your recipe for Georgia Peach Pound Cake and came across your blog (I will be trying it this weekend). I love trying new recipes and would love this book. Thanks. New follower and another Gawga gal! Can't wait to check out all the recipes. I'm always looking for new ones to try out. I'm waiting on my peach pound cake to be done. Can't wait. Please enter me in the cookbook drawing. Email is dgnoy@email.com. So glad I found your blog! I'm so excited about your peach pound cake. I hope you love it!